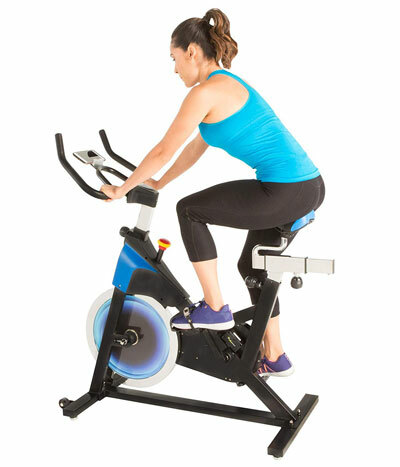 The LX 8.5 indoor cycling bike is one of the newest models from Exerpeutic, released in 2018. It’s a trainer made for home use but does have a heavy-duty construction, pretty close to light-commercial durability. This being said, it can support any spin workout. The bike is basically an upgraded version of the Exerpeutic LX7 that we’ve previously reviewed. It does not integrate a fitness meter like the LX7, but it’s Bluetooth smart so you can use your smartphone or tablet as the bike’s fitness meter. We’ll cover this in detail in one of the sections below. The Exerpeutic LX 8.5 has a heavy-duty frame, made of thick steel tubing. All the bars in its construction are rectangular and have precision-welded connection points. 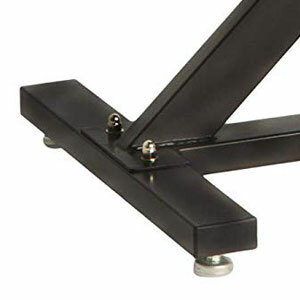 Most of the main frame is one-piece, with the exception of the base bars which attach to it via screws. All the steel parts in the bike’s construction are coated with a corrosion resistant paint finish. The color used is black. However, the upright post of the handlebar and the seat upright post/slider are coated with a chrome finish. Of course, there are several ABS parts in the bike’s construction as well, such as the belt cover and the brake assembly cover. However, these do not reduce the bike’s overall sturdiness, as they only fulfill a protective role. Compared to treadmills or other fitness machines, this exercise bike isn’t extremely large. The fully set up unit is approx. 44″ (112 cm) long, and approx. 22″ (56 cm) wide. Also, with the handlebar extended to its highest position, the maximum height of the bike reaches approx. 50″ (127 cm). 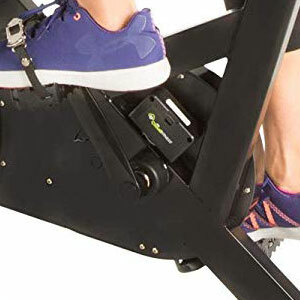 Considering these dimensions, it’s recommended to assign at least two feet of clearance all around the unit, to be able to perform any spin workout without any hassle. The bike isn’t super-heavy like a commercial model, such as the Body-Solid Endurance ESB250 for example, but does weigh approx. 89.5 lbs (40.5 kg). Therefore, its boxed transport may require two people. However, when fully set up, the unit isn’t too difficult to move because its front base is equipped with transport wheels. So, by using these wheels you won’t be handling more than half of its total weight. Last but not least, both base bars of the bike are equipped with adjustable metallic stabilizers. This being said, you can perfectly level it on any type of floor, in order to prevent it from rocking or tipping and achieve maximum stability. The Exerpeutic LX 8.5 is equipped with a high-comfort spin seat. This type of saddle integrates a thick layer of foam padding and also has a large longitudinal groove in order to provide superior ventilation under the user. This leads to a better, healthier blood flow. On the other hand, the seat has a standard attachment system. This being said, there are plenty of compatible options available. The seat offers 4-way adjustability (front, back, up, down). Its upright post offers multiple adjustment notches, while its horizontal slider also provides several inches of front to back adjustment. This being said, the seat can accommodate users between 5’2″ and 6’4″ (157 – 193 cm). Also, the seat assembly is durable enough to support users up to 300 lbs (136 kg). The handlebar of this Exerpeutic exercise bike only has 2-way adjustability (up, down). It has a multi-grip design, with a loop aero bar in the middle. It offers the possibility to exercise by holding it in a close parallel grip, standard grip, race grip, top grip, and more. Its side arms are fully covered by a sheet of rubber foam material which delivers optimal comfort and a secure grip. The handlebars don’t have any pulse sensors, and the Bluetooth device cannot monitor your pulse. Therefore, in case you need to keep an eye on your pulse, you will have to use a separate device. 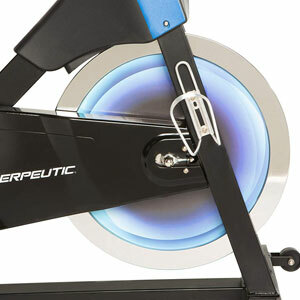 The Exerpeutic LX 8.5 is equipped with a 40 lbs steel (18 kg) flywheel just like many other light-commercial spin bikes. It has a perimeter-weighted structure which enables it to provides an aggressive inertia but also a steady pedaling motion. It has a chrome plating finish, while its side covers are made of ABS material. It also permits reverse pedaling; thus, you can diversify your workouts if you want. The bike uses a belt transmission. This being said, it doesn’t require periodic lubrication as a chain drive. It also generates less vibration. The crankset features highly durable arms and pedals. 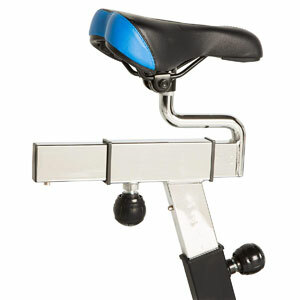 It’s designed to support users up to 300 lbs (136 kg) during full standing up pedaling sessions. The pedals are made of aluminum alloy. They’re equipped with adjustable toe cages, but do not have SPD elements for spin shoes. Replacement options for them are highly available, though. Their threads are standard 9/16. The Exerpeutic LX 8.5 features a friction resistance system with manual action. In other words, you don’t need to connect the bike to a power source in order to benefit from resistance. Its resistance elements include a brake pad which is attached above the flywheel and guarded by the top ABS cover. This brake pad is connected to the tension dial above the main tube of the frame. By turning the dial clockwise, the brake pad applies more friction to the flywheel and this way you benefit from a higher pedaling difficulty. It’s important to note that since the unit’s drive system is simple, without any gears like many road bikes, the pedals continue to spin while the flywheel is spinning. However, the tension dial also has the function of an emergency brake. So, by pressing it down, you can instantly stop the flywheel and the pedals from spinning. This Exerpeutic exercise bike is not equipped with a fitness meter like the LX905 model. However, it does come with a Bluetooth module which is attached to the frame, right above the crank. This Bluetooth module requires two AAA batteries, which are included. It is compatible with the free MyCloudFitness app which you can download from the Apple App store, or Google Play. The MyCloudFitness app features an interface similar to a bike computer. It tracks time, distance, speed, RPM, watts, and calories. It also offers the possibility to create goals for time, distance, and calories. Once you have downloaded the MyCloudFitness app into your phone, you can sync the bike with your phone, and use it as its fitness tracking device. The bike also includes a device holder which you can attach to the front loop aero bar, in order to place your phone or tablet on it. The bike’s core frame comes partially assembled. This being said, you only need to attach the base bars, the seat tube, the saddle, the handlebar tube, the handlebar, the pedals, and the device holder. This shouldn’t take more than 30-40 minutes. The manual provides clear assembly instructions, and some of the necessary tools are included. For maintenance, it’s recommended to periodically check for loose bolts and parts, and re-tighten or replace them if needed. 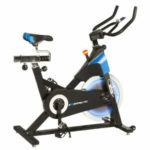 The Exerpeutic LX 8.5 is an indoor cycling bike designed for home use but does have a very sturdy construction, being able to support any spin workout. It features a 4-way adjustable seat, a 40 lbs flywheel, and a durable crankset with metallic pedals. It’s also equipped with a Bluetooth module so you can sync it with your phone for tracking your workout stats. In all, it’s a great bike for high-intensity cardio workouts, intervals, stamina development, and weight loss. It’s also considerably more affordable than a light-commercial bike.